"Star Wars Jedi Knight: Jedi Academy is a first and third-person shooter action game set in the Star Wars universe. It was developed by Raven Software and published, distributed and marketed by LucasArts in North America and by Activision in the rest of the world. 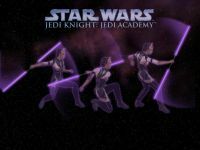 Jedi Academy was released in September 2003 and received positive reviews, achieving an 81% aggregate score. In September 2009, the game was re-released along with its 3 prequels through Steam and Direct2Drive. Jedi Academy is powered by the same version of the Quake III: Team Arena engine used in its predecessor, Star Wars Jedi Knight II: Jedi Outcast, containing modifications to the Quake code to include lightsaber combat. In a new feature to the series, the player can modify the character's gender and appearance, and can construct a lightsaber by choosing the hilt style and blade color. The player takes control of the character Jaden Korr, a student at the Jedi Academy under the tutelage of Kyle Katarn. The player must complete various missions assigned to them by Katarn and Luke Skywalker. There is a multiplayer mode that allows the player to play against other people over a network." Source: Wikipedia, "Star_Wars_Jedi_Knight:_Jedi_Academy," available under the CC-BY-SA License.